Your work is so good. The message and the art...just really good. I'm an artist too. I used to do "names" in drawing, if that makes sense. Now I'm doing oils and experimenting. I love this! You are such a great artist, everything you do is so creative and I've never seen anything like your work before. Keep up the great work! Love the agnostic bishop. Brilliant stuff, as usual. hahah! I used to love playing chess. What a dork I was back then. Actually, chess is cool. I'd still play it. As a chess fanatic, I really like this. As a person with a degree in political science, I like it even more! Haha. My brother, who loves chess, will get a kick out of your comic! Wow, great stuff. Really liked this. Love it, and I love it even more considering what's curently going on in the world. Congratulations on getting on "Blogs of Note" you really deserve it. Great artwork Grant! Just found your blog. It's really great. I love it so much!!!!!! Nice work! How long did it take to do it so perfectly? Haha, somehow giving the chess pieces personality takes away from the gracefulness of chess. Sweet!...or mabye not, of course it is, but then again? Such a good art n the way you thinking is extraordinarily good! Good art, well observed and good sense of humour. As you can probably guess I enjoy your posts. Ha! That made my day. Great stuff. I love the title of this post, and the picture even more. 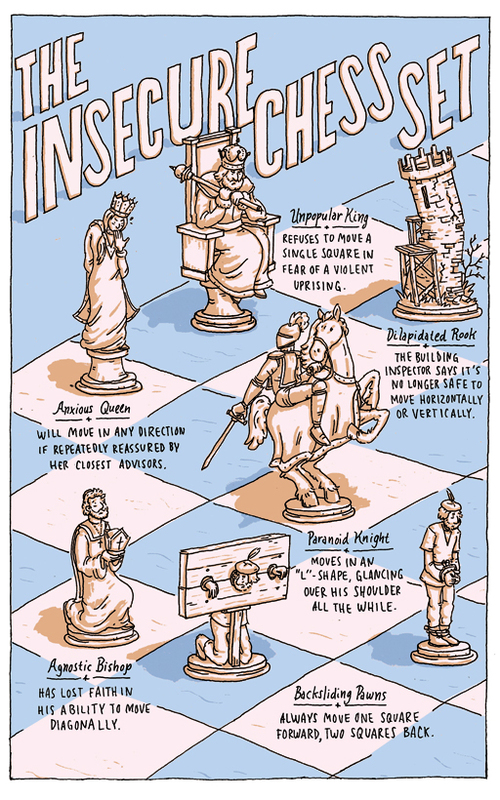 Great illustration on an insecure chess set! Now I'll always be thinking of the psychology of my chess sets. I feel kinda bad for them now.